Etiquipedia: French Court Etiquette at Versailles and Who Was "Madame Etiquette"? Marie Antoinette's royal family in Austria was quite informal, so the seemingly absurd etiquette at French court annoyed her greatly. Marie Antoinette would pick at food, preferring a second meal be served in her private chambers. It was in the Queen’s antechamber that the public meals were held, whose sumptuous ritual, Grand Couvert, attracted a large crowd. 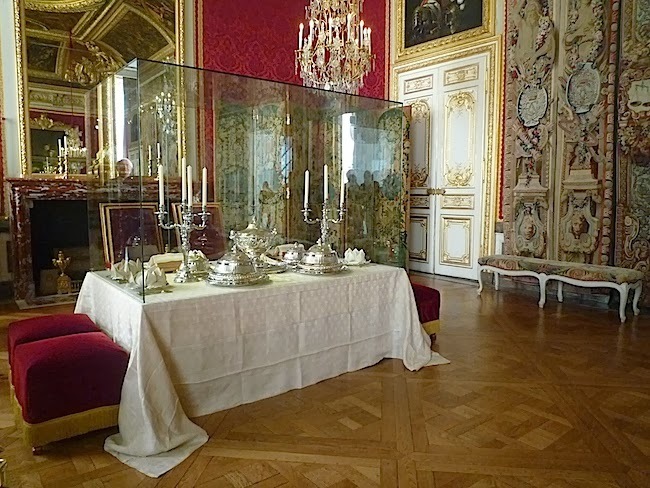 Grand Couvert was a public ritual, in which the French King and Queen ate their dinner in public view. Only the royal family could take their places at the table and before them, seated, the duchesses, princesses or high-ranking persons who had the privilege to sit on a stool, then, standing, the other ladies and persons who, due to their rank or with the authorisation of the usher, had been allowed to enter. The room where Marie-Antoinette didn't eat her dinner; The Salon of the "Grand Couvert" has been restored to its past splendor, part of an ongoing refurbishment of the entire palace. "The Queen sat on the King’s left. They had their backs turned to the fireplace […] The King ate with a good appetite, but the Queen did not remove her gloves and did not use her serviette, which was very wrong of her". To counter this boredom, Marie-Antoinette asked for there always to be music in the Grand Couvert and for that purpose a platform was set up for the musicians in this room. Those wanting to speak to the king were not to knock on his door. Instead, using the left little finger, they had to gently scratch on the door until they were granted the permission to enter the room. Many courtiers grew that fingernail longer than the others for that purpose. A lady never held hands or linked arms with a gentleman. It was in very bad taste and nearly impossible because a woman’s skirts were so wide. She was to place her hand on top of the gentleman’s bent arm as they strolled through the gardens and chambers of Versailles. Ladies were only allowed to touch their fingertips with the men. The king and queen always had a fauteuil (armchair) to sit on. In their presence, no one else was allowed an armchair, unless you were also a monarch. A chair with a back but no arms was allowed for those closest in rank to the king, such as his brother or children. The tabouret, a padded stool was awarded to those holding the rank of duchess. Lesser ranking nobility would be expected to stand. For nightly Grand Couvert, men and women had to dress appropriately. Appropriate dress included swords for the men. If a gentleman arrived at Versailles for Grand Couvert without his sword, it is said he could rent one. Etiquette for the aristocracy included how to use a napkin, how far to unfold it in one's lap and when to use it . Only ushers were allowed to open doors. If you desired to leave the room, you had to wait for the usher to open the door. "During the 17th century, in France, manners became a political issue. King Louis XIV and his predecessors, in collecting together the nobility of France to live with the sovereign at Versailles, instituted a sort of school of manners. At the palace, the courtiers lived under the despotic surveillance of the king, and upon their good behavior, their deference, and their observance of etiquette their whole careers depended. If you displeased a Louis, he would simply "not see you" the following day; his gaze would pass over you as he surveyed the people before him. And not being "seen" by the king was tantamount to ceasing to count, at Versailles. A whole timetable of ceremonies was followed, much of it revolving around the King's own person. Intimacy with Louis meant power, and power was symbolically expressed in attending to certain of the king's most private and physical needs: handing him his stockings to put on in the morning, being present as he used to chaise percée, rushing when the signal sounded to be present as he got ready for bed. It mattered desperately what closeness the king allowed you - whether he spoke to you, in front of whom, and for how long. The point about Versailles was that there was no escape: the courtiers had to "make it" where they were. The stage was Louis's, and the roles that could be played were designed by him. It was up to each courtier to fit him- or herself into one of the slots provided. The leaders of all the other towns and villages of France were made, largely through the use of etiquette, and more specifically through rudeness and judicious slighting by the tax-collecting intendants, to feel their subordination, the distance from the court. Once, the nobility had relied on strength, swagger, and vigor, even violence, personally to make their mark and uphold their honour; at Versailles, the way to success became discretion, observation, cunning, and the dissembling of one's aims and passions. At Versailles, and at the courts all over Europe which imitated it - everything was done to make it very clear who was superior to whom; and of course, each time anyone was polite, he or she was simultaneously acknowledging rank and demonstrating who stood where. The new manners - both the formal rules of protocol and precedence and the unspoken, more profoundly enculturated rules like table manners - were seen increasingly, according to Elias, as ways in which one did not offend other people. You were controlling yourself, so as to prevent other people from being disgusted or "shocked." People lived very closely together at Versailles; everyone was watched by everyone else, and actual physical proximity helped raise some of the new sensitivity to other people's real or imagined susceptibilities. Men were expected on the whole to give up physical force as a means of getting their way, and - as always when "the graces" are preferred over brute strength - women begin to count for more. Within the aristocratic court circle, people became, in spite of the obsession with rank, far more equal. Secure in the knowledge that just being at court was the pinnacle of prestige, from which most of society was shut out, courtiers could permit themselves to respect each other. As the bourgeois became richer and more indispensable even at court, they demanded - and were given, by self appointed experts who wrote manuals for them - instruction in how to behave as people did in "the best circles." In 1672, Antoine de Courtin produced "Nouveau trait' de la civilité' qui se pratique en France parmi les honnestes gens" or The "New Treatise of the Civility Which is Practiced in France Among Honest People." ("Honest" -hônnete- kept its original association with honour and the opposite-but-supporting motion, shame.) De Courtin writes about manners for both hosts and guests, and invite advises his bourgeois readers on how they should address the nobility. The church in France also produced handbooks of manners and talk to precept in schools. Gradually gentility spread down from the court to the bourgeois, and finally trickled further down to the rest of the population. The bourgeois were even stricter about standards of civility than were the nobility were; having no ever-present King do enforce the rules, they imposed restraints on themselves. Being more anxious to rise, they had more to lose by making slips and gaffes; so their self-inhibiting mechanisms had to be deeper rooted, less obviously the donning of an external personna than the nobility could permit themselves. The policing of emotions became internal, and finally invisible even to themselves: they were able to think that they acted, not in obedience to power and self-interest but for purely moral reasons." "The whole of France around the King"
The spacious quarters at Versailles allowed a large Court to live in residence close to the King. Depending on the days, 3,000 to 10,000 people crowded there, forming a very varied society with a rigid hierarchy. Some were there by birthright, others by social obligation, others out of self-interest or curiosity, and others still to earn their living. The high-ranking nobility were often present, currying the favours of the master of Versailles. The courtiers were obliged to follow the rules of Etiquette. These extremely strict rules governed priority, determining not only who was allowed to approach the important people in the Court, but also where and when. Gestures and language were also codified and varied subtly according to the circumstances: this included using titles to address different people, the right to sit down, and use an armchair, a simple chair or a stool, etc. Among the courtiers, those who held a role were said to be "established" at Court. These roles, either inherited or purchased, often very dearly, corresponded to a function or office. For the most important, the King's approval was essential; this was particularly the case for the secretaries of State. But for a simple valet de chambre or barber, the agreement of the Grand Master of the King's Household was sufficient. Living quarters in the palace were also highly sought after. They avoided much travelling back and forth and provided a place of retreat for those moments when one was not at Court. The princes of the royal family had apartments overlooking the gardens, while "established" courtiers were accommodated on the town side or in the Palace outbuildings: in the Grand Lodgings, the Stables and so on. Serving the King in the army or in high administration was the principle means of gaining the Monarch's favour, even if the art of appearances at Court remained essential. Personal attributes, such as beauty or wit, rivaled with dazzling finery to attract the Monarch's attention. By granting the Court greater importance than either Henri IV or Louis XIII had done, Louis XIV gave the nobles a sense of service. Serving was a means of pleasing the Sovereign, it was useful to the kingdom and contributed to a certain control over the nobility, thereby strengthening the royal authority. "The person of highest rank in the company should unfold his napkin first, all others waiting till he has done so before they unfold theirs. When all of those present are social equals, all unfold together, with no ceremony." Fashionable men of the time wore stiffly starched ruffled collars, a style protected while dining with a napkin tied around the neck. Hence the expression "to make ends meet." When shirts with lace fronts came into vogue, napkins were tucked into the neck or buttonhole or were attached with a pin. In 1774, a French treatise declared, "the napkin covered the front of the body down to the knees, starting from below the collar and not tucked into said collar." Nobility in France was generally hereditary and was passed down through the male line. It had certain privileges attached to it, such as being exempt from taxes, sole access to certain offices and positions within the civil and military administrations of France, and all commissions in the army. There was a sense that as a noble, one was possessed of greater intelligence, more refined sentiments and in general more deserving of the best life had to offer. 2) By holding certain offices, either by purchase or appointment, such as in the king’s household, or in the Parliament. These titles as well as the names of the family were derived from the properties they were attached to, and only one person at a time could carry each of these titles. However, the presence or absence of a title was not in itself a test of nobility, because there were generally more family members than there were titles to go around. One you have reached the threshold of nobility, there are still more degrees of nobility: How long has your family been noble? How many of your paternal and maternal grandparents’ lineages were noble? The oldest nobility was traced to the “Mists of Time,” back in the early recorded history of France. Of those already blessed enough to claim the ties of nobility, some could also claim peerages. These peers originated from the twelve dukes who were raised in the 12thcentury above the other dukes by the King as his direct vassals. Though forks had established a foothold in the polite society of France, by the later 1500s, Louis XIV still ate with his hands. He had plenty to say about using one's knife though... Etiquette required that aristocratic nobleman always bring their own dining implements to banquets. Specifically, the dagger used for both cutting and spearing their food. Some diners used the tip of their daggers/knives to pick their teeth, which one can imagine was disgusting. Louis XIV put an end to such spectacles by outlawing pointed, double-edged personal use daggers, thus creating a demand for not with a rounded and and the single cutting edge that we have today. 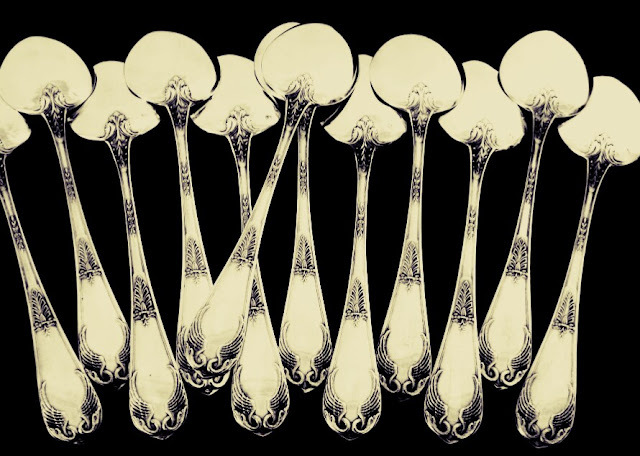 Louis XIV was also the first king to provide his dinner guests with individual place settings of a knife fork and spoon so they need not bring their own. There were ecclesiastical peers, which ranked ahead of lay peers. For lay peers, the order of precedence was determined by date of peerage’s creation- except as it applied to Princes of the Blood, they gained precedence over the other peers, regardless of peerage creation date, because of their claim to royal blood. By the time of Louis XIV, the main role of the peers was to participate in the coronation ceremony. This was important, because it created precedence in day-to-day life for the title-holder over others without this distinction. Even more important than title was rank. Rank in regards to the Court of France can be understood as a degree of eminence within the class of nobility. It was measured from the king on down, so the highest ranks were filled by the individuals most closely related to the king, and the higher the rank, the greater the precedence. After the immediate relatives, there were the Princes du Sang, or “of the blood,” who were related to the royal blood in a lesser concentration than the immediate family. The framework of rank and precedence were pretty firmly fixed. There might be wiggle room in certain situations, but being that everyone was fiercely protective of their rights of precedence, any concession a person finagled for their self would usually be nullified at the next occasion, and they would be put back in their place. 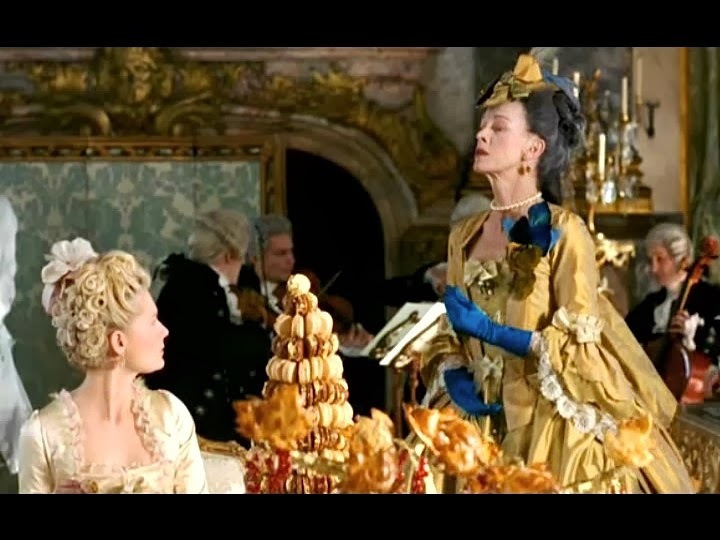 Madame Etiquette was played by Judy Davis in 2006's "Marie Antoinette"
While these distinctions seem unimportant today, in the 17th century knowledge and use of proper etiquette was vital because it was the foundation of the social order and political system of the ancien regime. Using one of the most often cited subjects of this code of etiquette are the rules of seating arrangements. The king and queen always had a fauteuil, an armchair to sit upon. Within their presence, no one else was allowed an armchair, excepting another monarch. A chair with a back but no arms was allowed for those closest in rank to the king, such as his brother or children. The tabouret, a padded, drum-shaped stool was awarded to those holding the rank of duchess. Lesser ranking nobility would be expected to stand. It is in your interest, brother, that the majesty of the throne should not be weakened or altered; and if, from Duc d'Orleans, you one day become King of France, I know you well enough to believe that you would never be lax in this matter. Before God, you and I are exactly the same as other creatures that live and breathe; before men we are seemingly extraordinary beings, greater, more refined, more perfect. 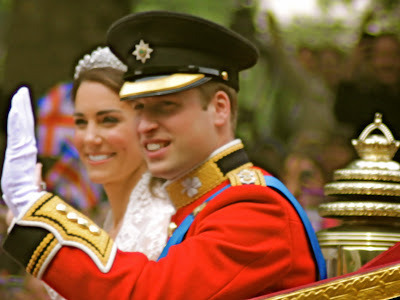 The day that people, abandoning this respect and veneration which is the support and mainstay of monarchies,--the day that they regard us as their equals,--all the prestige of our position will be destroyed. Bereft of beings superior to the mass, who act as their leaders and supports, the laws will only be as so many black lines on white paper, and your armless chair and my fauteuil will be two pieces of furniture of the selfsame importance. In other words, the importance of your position at Court was dependent on how well you recognized and defended etiquette. Personal feelings were irrelevant because the symbolic place held by a person mattered more. Your place and the attention you received devolved from the treatment of others around you. Rank and precedence was the visible glue holding the structure of the ancient regime system together. To ignore and disparage this meant that the whole system would come into question, as it did in the reign of Louis XVI. 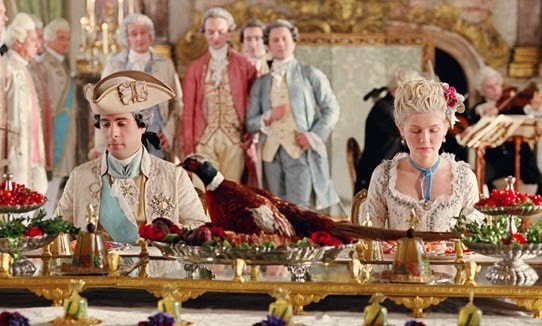 Obviously there were more factors involved in contributing to the great social upheaval that was the French Revolution than etiquette being marginalized, but it is a way to compare and contrast why society changed; why it happened in 1789 and not before (as there had been governmental insolvency and peasant uprising during the reigns of Louis XIV and Louis XV). These servile rules were drawn up into a kind of code; they offered to a Richelieu, a La Rouchefoucauld and a Duras, in the exercise of their domestic functions, opportunities of intimacy useful to their interests; and their vanity was flattered by the customs which converted the right to give a glass of water, to put on a dress, and to remove a basin, into honorable prerogatives. So, while she was a victim in many ways, Marie Antoinette played a role in this marginalization of etiquette: She did not want to dispatch the role of queen in the prescribed manner and chose instead to retreat from the endless rules into an environment of informality, thus depriving the Court of opportunities for acting out their duties (which were considered not to be a chore but an honor to hold), and therefore made her position seem unnecessary at worst and meaningless at best. 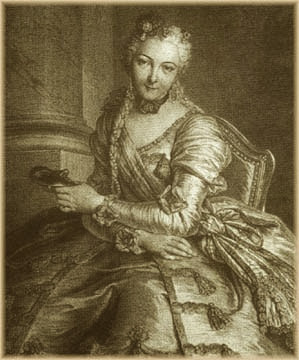 Anne d'Arpajon, aka "Madame Etiquette" ~A French aristocrat and first lady of honour to Queens of France, Marie Leszczyńska and Marie Antoinette, Anne d'Arpajon was called "Madame Etiquette" by Marie Antoinette for her insistence that no minutia of court etiquette ever be disregarded or altered in any way.